Well finally we are having a DHS appt. most likely in February! We decided to wait until February because our church mission trip will be then. 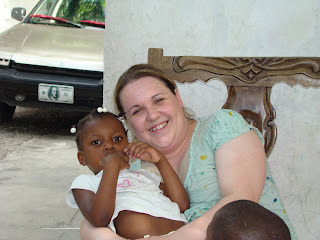 We are blessed to be in leaders of our missions in our church and blessed to be able to make 2009's trip to Haiti. I would have been sad to go to Nigeria instead of Haiti. But please don't get me wrong I can't wait to go to Nigeria it just would have been hard to not go to Haiti and see Naitile. But it's awesome to do both see Naitile and hook up Three Angels with some awesome people. Be in prayer about the team going to February and that God will lead the right ones to go. Right now there is too many interested but I know that God has a way to adjust that. I also know that people need to be open to His voice. I am so excited because even though Naitile will not be able to stay the night with me I heard that she may be able to come and swim, eat and etc. It's funny I don't have any idea what size of clothes or what to pack. All ideas and suggestions are appreciated. In case you were wavering I just want to let you know that God is so awesome and He has your best interest in mind. During the holiday season it's so easy to get caught up in all the events and forget the reason we celebrate. Don't forget to take time to talk to God and also during that time lead your ear because He does talk back if we only listen. I'm so glad that you're leading a team from your church in February!!! It's going to be awesome! How exciting you are going back in February! It will be exciting to see Naitile and bless everyone at 3A's. So many great things happening this week with our TA's families! I am so glad you are going to be going down to see your sweet girl. Lets be sure to get in touch about donations for your team. I currently have over 25 boxes here of supplies for TA's. I will happliy drive them down to you guys!! !